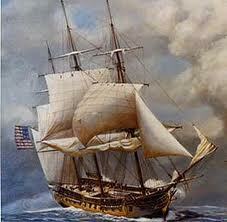 The so-called Quasi-War was an undeclared naval war between the United States and France. This 'forgotten war' engaged the navies of these two former allies from 1798-1800. The following links deal with the first major conflict fought by the new U.S. Navy. "Constellation" vs "La Vengeance"--Contains primary source material from Commodore Thomas Truxton regarding his ship's combat with the French vessel "La Vengeance". Part of the Maritime History Virtual Archives. The Quasi War with France--From the Napoleon Series web site. Quasi-War with France--This Navy site looks at the medical ramifications of the Quasi-War and the innovations introduced to Navy medical care during this period. Quasi-War With France, 1798-1800--From the U.S. State Department. Quasi-War - The Quasi-War was an undeclared war fought entirely at sea between the United States and France from 1798 to 1800. Wikipedia article. Navy History: Federal/Quasi-War--This Naval site deals with the history of the Navy after the Revolutionary War. Contains information on the Barbary Wars as well as the Quasi-War. The conflict with France is about 2/3 of the way down the page. A History of Ships Named Enterprise--Long before Captains Pike, Archer, Kirk, and Picard roamed the 'final frontier', the U.S. Navy possessed several warships named Enterprise. One of them engaged the French in the Quasi-War. This site is different, but interesting! You could say that the U.S. Navy has "lived long and prospered" since that early conflict. Do We Have Any Records Relating to French Spoliation Claims?--From the Prologue: Quarterly of the National Archives and Records Administration Spring 1991, Vol. 23, No. 1. Discusses what happened with American claims against France and other nations regarding ships seized in the period of the Quasi-War. Lee, R. "The History Guy: The Quasi-War (U.S.-French Naval War)"